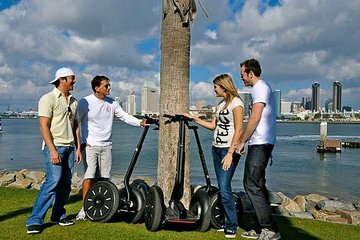 Explore the best of San Diego with a 2-hour, guided Segway tour that loops through the city’s most important sights. Glide through San Diego history in the vibrant Gaslamp District, and enjoy stories about California’s rough-and-tumble frontier past. Watch for dolphins and sea lions as you cruise the bustling waterfront, pass historic naval vessels and the home of the San Diego Padres. Steer into the 1,200-acre (486-ha) Balboa Park to explore manicured gardens, thick forest stands and the city’s best-preserved architecture inside the largest urban park in the United States. This was a fun. Todd covered a lot of ground, was informative and entertaining. With two teenagers our primary goal was just that....fun and seeing the sights. The trip was absolutely wonderful. Todd, our guide, was knowledgeable, courteous, funny at times, and placed our safety and enjoyment above all else. We had never ridden a Segway and he quickly put us at ease and in command. We would do it again and make the trip twice as long and beautiful. I THOUGHT I WAS GOING TO BE GIVEN A CITY TOUR IN A SEGWAY! NICE RIDE IN A SEGWAY BUT LACKED ESSENCE. TOUR GUIDE WAS A NICE GUY BUT HE BRIEFLY POINTED OUT TWO OR THREE PLACES. SORRY!